posted by Lisa Ace in ponsored Post, advertisement, East Bethany Presbyterian Church. East Bethany, Holiday Happenings, Vendors, crafts, Santa..
posted by Lisa Ace in Sponsored Post, advertisement, East Bethany Presbyterian Church. 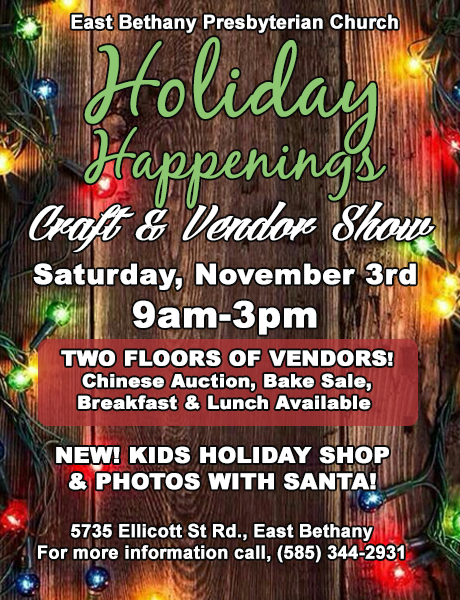 East Bethany, Holiday Happenings, Vendors, crafts, Santa. posted by Dawn Vanderkooi in chinese auction, crafts, Vendors, Wonderful baked goods, raffles. Join us on Thursday September 15th at St. Mary's Church (Basement) for a special Fundraiser for RAP! Several vendors will be there from 6pm-9pm to offer their wares. We will have Chinese Auctions, raffles, and much much more. Learn more about RAP by visiting their website at: www.geneseeny.com/rap. posted by Melissa George in batavia, business, Vendors, Home Show. The Batavia Area Jaycees are looking for vendors for the 58th Annual Home, Garden & Trade Show taking place on March 19 & 20 at Batavia Downs. Visit www.jci.cc/batavia for your vendor packet! posted by James Renfrew in auction, byron, food, children, Duck Race, Vendors. Memorial Day in Byron, Monday May 25th. 9:00 AM - Plant Sale at the Byron Presbyterian Church on Rt. 262. 11:00 AM - Town Parade (begins on Terry Street and proceeds east on Rt. 262, concluding with a ceremony at the Byron Cemetery). Noon - Free games for children in the park next to the Presbyterian Church on Rt. 262, also featuring "Mr. Squiggles" (Mr. Squiggles is sponsored by the Byron-Bergen Library through a grant from the NYS Council on the Arts Decentralization Program). posted by James Renfrew in auction, byron, food, Duck Race, Vendors. 1:00 PM - Big Auction on the lawn of the Presbyterian Church, Rt. 262. Antiques and furniture are included. 3:00 PM - Duck Race, sponsored by the Byron Town park Committtee - purchase your chances throughout the day at the park next to the church. Watch the thrilling finish on the Trestle park Bridge, a short walk from the Presbyterian Church. For more information, please call the Presbyterian Church, 548-2800. For vendor table space, please call Laura at 548-2245.